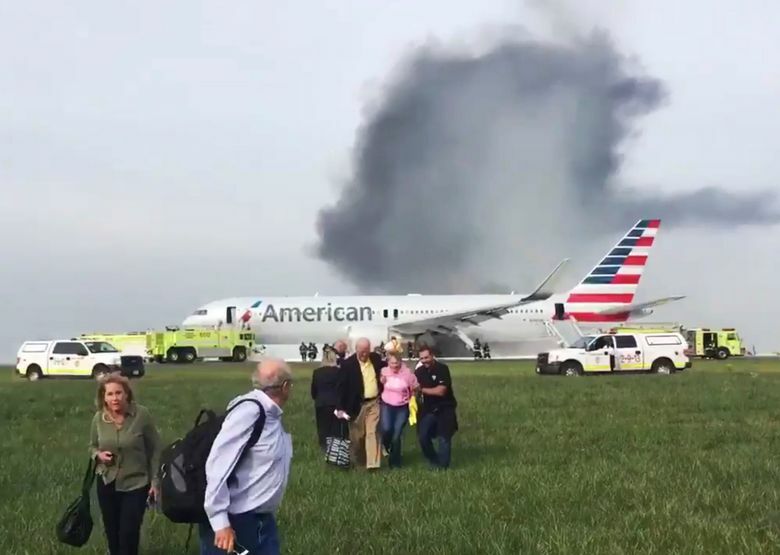 WASHINGTON (AP) — An engine disk that broke apart and forced an American Airlines jet to abort a takeoff in Chicago last week shows signs of fatigue cracking, according to a preliminary report released Friday by accident investigators. A high-pressure turbine disk in the Boeing 767’s right engine broke into four pieces, which shot out of the engine’s housing. Investigators have recovered about 90 percent of the disk, and an examination shows evidence of an anomaly where the fatigue cracking begins, the National Transportation Safety Board report said. Metallurgical examinations of the disk are underway to determine what caused the cracking, the report said. The anomaly was inside the disk, rather than on its surface, where it would be visible. Such anomalies are usually the result of a manufacturing defect. The engine involved in the Oct. 28 incident is a General Electric CF6-80. In a letter Friday to owners of the same engine type, manufacturer General Electric Co. said one engine containing a “closely related” part was still being used. GE said it was working with the operator of that engine, whom it did not identify, to remove the part. A GE spokesman said he did not know which airline had an identical engine disk to the one that failed on the American jet. Disk pieces were spewed up to a half mile away and a fierce fire enveloped the right side of the plane after the failure. The plane was traveling at 154 mph and was seconds from lifting off from O’Hare International Airport for Miami when pilots slammed the brakes. All 161 passengers and nine crew on American Airlines Flight 383 were evacuated. Twenty-one people suffered injuries, mainly from the evacuation down inflated ramps. Such “uncontained” engine failures are rare and serious events that can cause extensive damage to the aircraft. The broken pieces are fired out of the engine at high speeds, effectively becoming shrapnel. The NTSB has identified at least three previous uncontained engine failures in commercial airliners in which a disk from the same family of GE engines broke apart — two on the ground in the United States in 2000 and 2006, and one while an Air New Zealand plane was climbing after takeoff on a flight from Australia to New Zealand in 2002. But those cases involved a different type of disk, and it’s not clear there is any relationship to the disk failure in Chicago. This story has been corrected to say one of the previous uncontained failures in the U.S. occurred in 2000, not 2002.